Butterflies aren’t just beneficial because of the beauty that they add to our gardens. Butterflies pollinate many plants and crops, ensuring the production of seeds and fruits required for the continued survival of plants, animals and humans. They are also a valuable source of food for songbirds. Despite their benefits, they are voracious, but picky eaters. One butterfly can lay enough eggs to wipe out an entire garden full of their preferred plant. Providing any type of flowering nectar plant will probably attract one or two butterflies to stop by your yard from time to time. But if you really want to make your yard something more than a fast-food fueling spot for these beautiful creatures, you must provide both nectar plants for the adult butterflies and host plants for the larval caterpillars. Yes, caterpillars will leave holes in the plant leaves and chew certain species of host plants down to the ground. However, the joy and educational experience of witnessing the entire butterfly life cycle makes it worthwhile to buy some plants specifically for their use. Adult female butterflies lay their eggs on larval host plants. The eggs are sometimes as small as the head of a pin, but within a few days, a tiny caterpillar emerges and begins pursuing its life’s purpose-to eat! Caterpillars eat constantly, until they get too big for their own skin. Then, they shed their skin to make room for more food. This process is repeated numerous times until the caterpillar reaches up to 27,000 times its original size. Many caterpillars have their own defense mechanisms for repelling predators, such as stinging spines or bristles, but the survival rate of caterpillars is still as low as 2 – 3 percent from egg to butterfly. Once fully grown, the larva seeks a safe place to attach itself with a fine strand of silk-like material and form a chrysalis. The chrysalis state can take anywhere from one week to one year, depending on the species of butterfly and weather conditions. This is where the transformation to a butterfly takes place. When the butterfly is ready to hatch, the process happens very quickly, so only the most observant catch a glimpse of this “birth”. However, if you have butterflies in your yard, you will often be able to witness the newly hatched butterfly as it hangs from its chrysalis drying its wings in preparation for its first flight. To be able to witness all or part of this wonderful garden miracle, you must select the right plants. For nectar, choose plants that are brightly colored and fragrant. Large blooms provide a place for the butterfly to land while feeding. Plant a wide variety of flower species and keep different blooming times in mind so that you can feed the butterflies through several seasons. Adult butterflies prefer to feed in full sun and in an area sheltered from the wind. 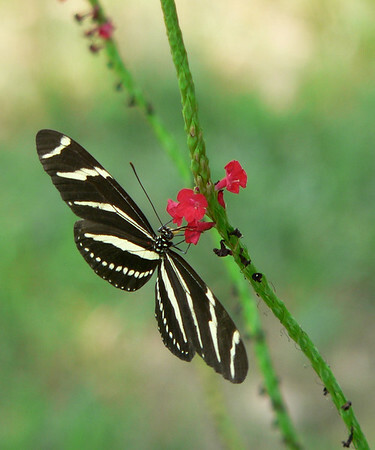 For larval, or caterpillar plants, most butterflies feed on only a limited number of plant species. If you are trying to attract a specific type of butterfly, you must plant the larval food that is preferred by that species. It is important to avoid pesticides in your yard if you want butterflies. Both the butterflies and the caterpillars can be harmed by any sort of toxic chemical.